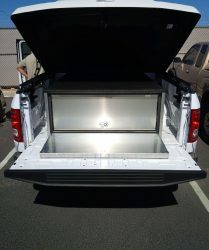 Oftentimes first responders are required to carry out command operations and must maintain the ability to transport and store their special equipment. 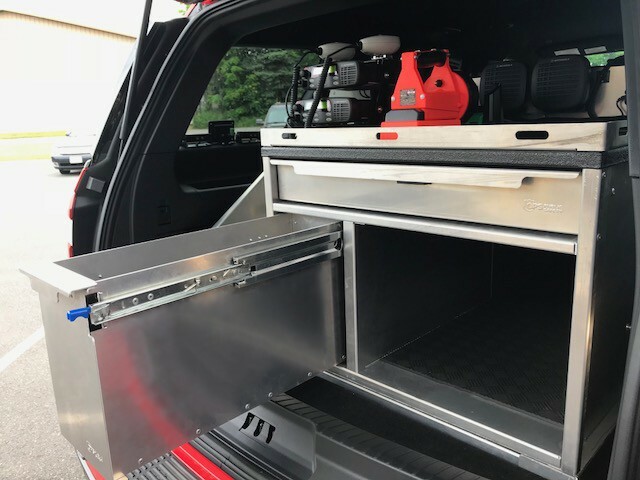 Hamden Fire Department in Connecticut was one of many departments looking for a solution to accommodate all their tactical equipment and ensure it was secure and accessible in the field. 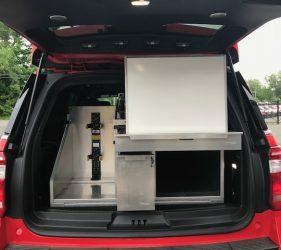 Hamden Fire reached out to OPS Public Safety about designing a unique cabinet for their Ford Expedition that was lightweight, durable and diverse to secure all their command equipment. 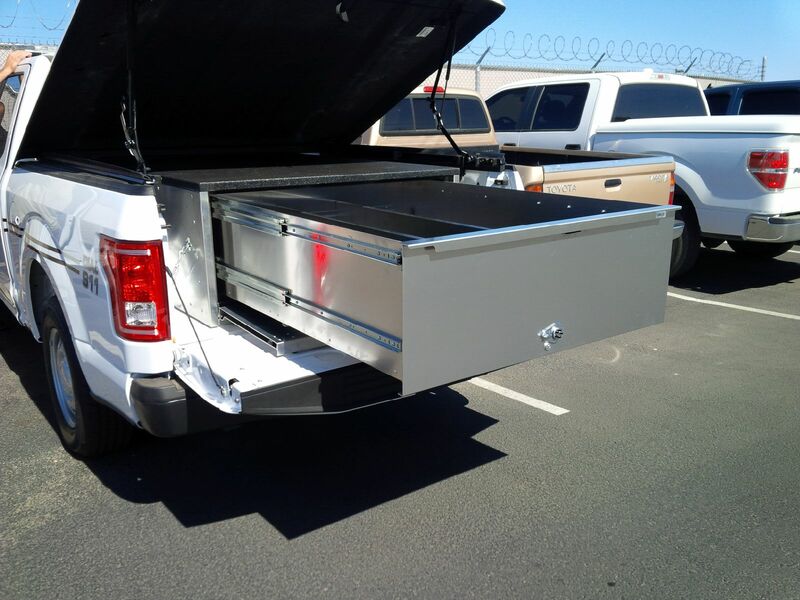 Due to weight and longevity concerns they wanted a solution manufactured out of aluminum. Hamden Fire knew that with everything they wanted, this unit was not going to be an out of the box solution. 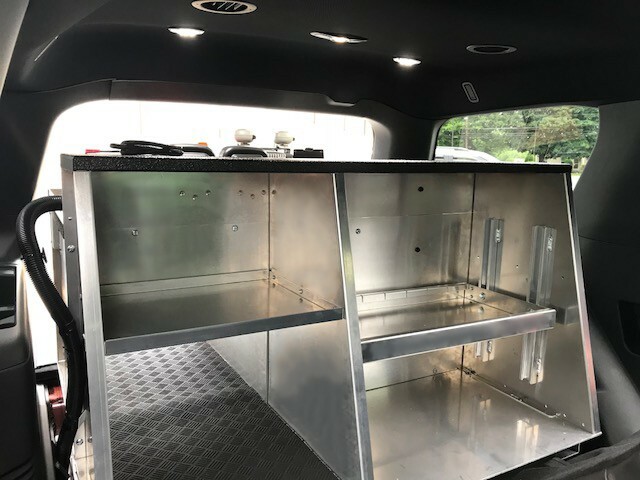 This unit needed to incorporate a whiteboard drawer, shelf space for tactical equipment and the ability to store a Mobile Incident Command System. OPS Public Safety’s Manager of Business Development, Shane Lawrenson, went to the drawing board with the sales engineers to create a solution that conforms to their requirements. 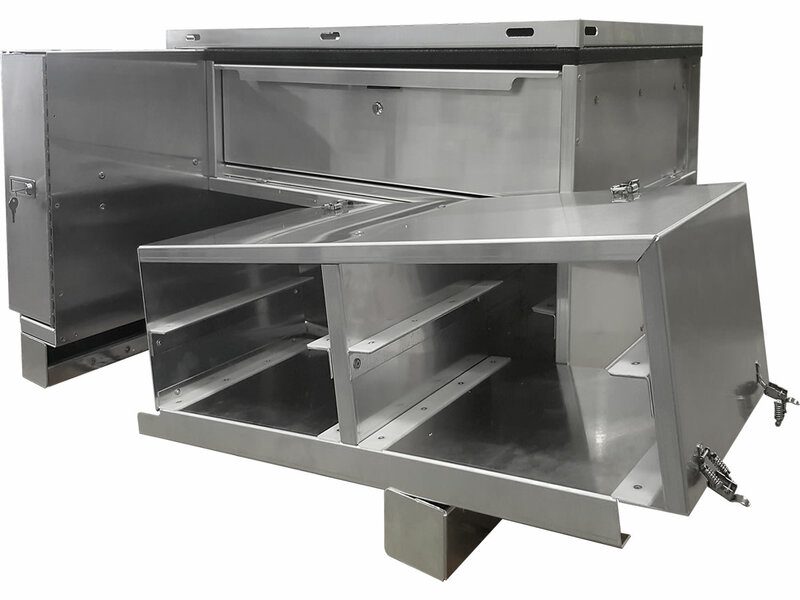 After a couple of revisions, a configurable solution was designed to fit the department’s specific needs and was installed by MHQ in Connecticut. 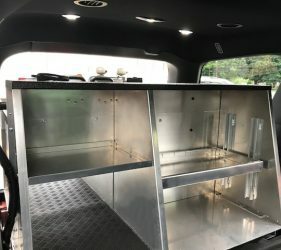 The front of fire unit included a whiteboard drawer for planning out command tasks on-scene, a small drawer for filing papers, a storage compartment for SCBA and air packs, and a passenger side storage space with checker style rubber matting to secure a Mobile Incident Command System. 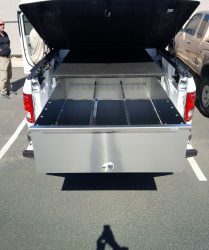 Another unique feature of this unit is that it included a rear shelf unit for tactical bags behind the second-row seat of the driver’s side. 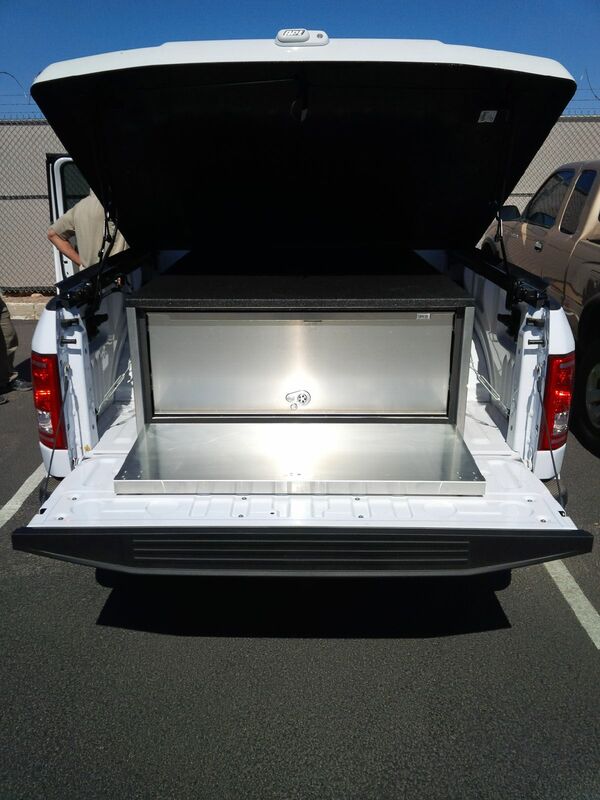 Lastly, the top of this unit was lined with an anti-skid layer with cargo rails around the sides and back to provide additional storage space. 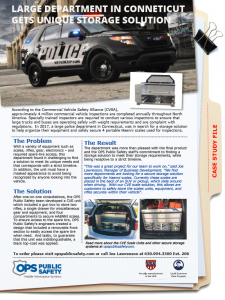 OPS Public Safety was able to create a custom solution that addressed this department’s distinct requirements. With drawer slides rated at 200lb. total capacity this unit will be able to hold Hamden Fire’s various tactical equipment without a doubt. With the EZ single-handed latch system, responders can access their equipment and carry-out tasks efficiently. 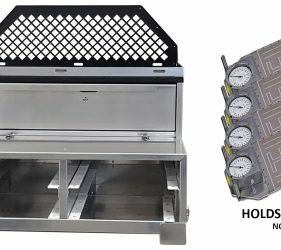 This unit is also manufactured out of our durable, lightweight aluminum, so it is built to last – an average of 12 years. This allows for Hamden Fire to transfer this unit into another vehicle in the future. 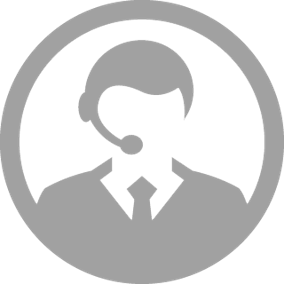 Call our Customer Care team today at 630-994-3300 to learn more about how we can help your department find the perfect solution like we did for Hamden Fire! Thank you to MHQ CT for another quality installation. 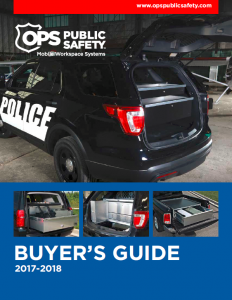 There has been a growing trend of law enforcement agencies purchasing pickup trucks over sedans and SUVs over the last few years. Reason being? 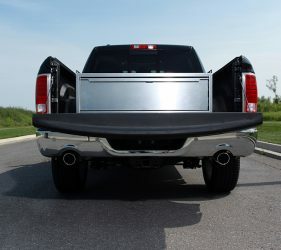 Pickups are more tough and durable, trucks have a greater haul capacity, more cargo room and storage, pursuit performance, as well as interior comfort. 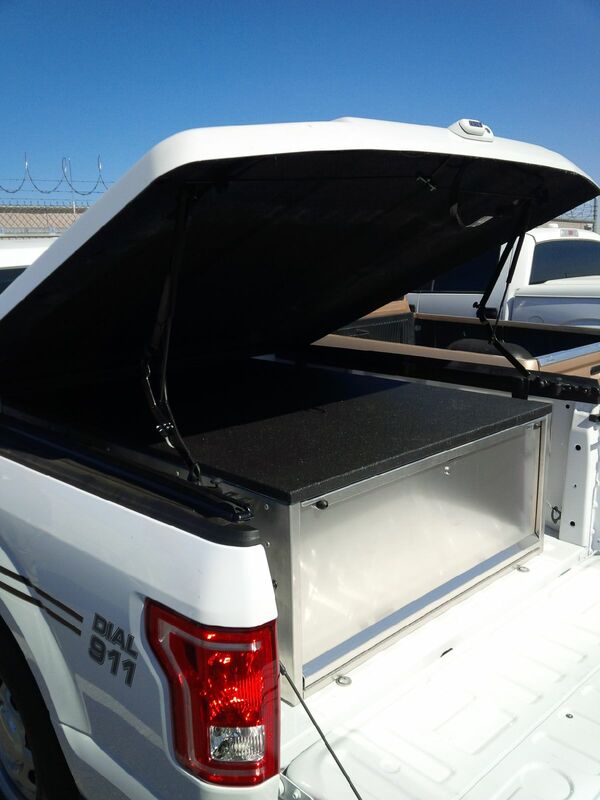 With all the accessories options available aftermarket, law enforcement agencies are often in search for a customizable solution to help organize their equipment and weapons in the truck bed, with the peace of mind of it being safe and secure. That’s when OPS Public Safety steps in. In the field, officer’s need to be able to access their equipment and weapons quickly and easily, without jeopardizing security. 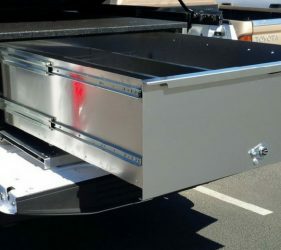 Often equipment is stored in the back seats or the cargo bed. One – with this approach, the equipment and weapons aren’t safely secured and protected. Two – when driving or in a pursuit chase, the equipment will move around, which can cause damage. Every police department carries different equipment, so a standard storage solution is not always the answer. 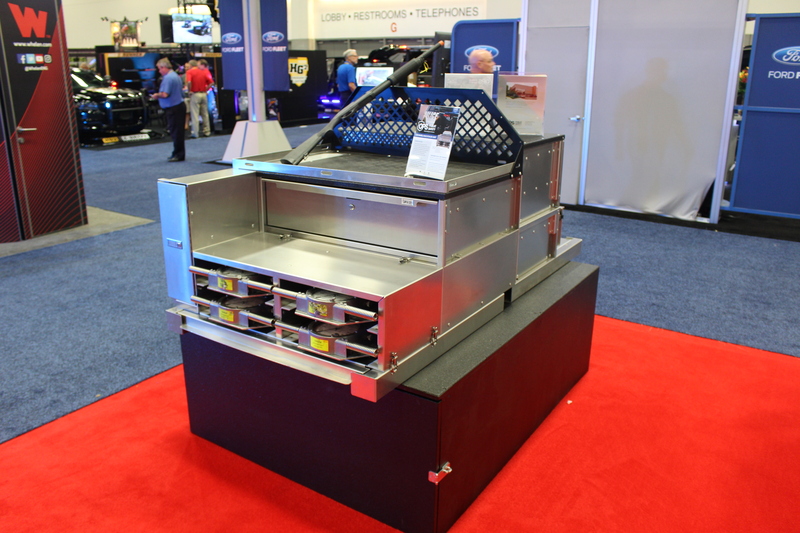 OPS Public Safety has designed and engineered a series of configurable pickup drawers to help each department organize and protect their equipment and weapons, making it easily accessible yet secure when not in use. 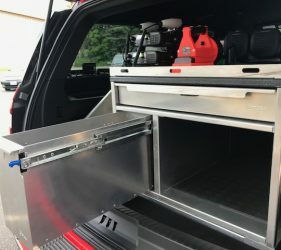 For example, the Maximizer Single Drawer is an all-American, lightweight aluminum heavy-duty construction drawer with 500lb drawer slides, built to store a lot of equipment. 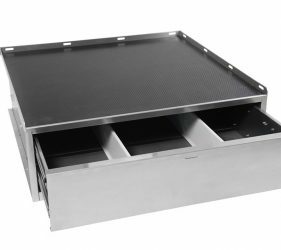 Some of the benefits of the Maximizer single drawer is the anti-skid top surface with tie-down points to accommodate larger items, an easy one-handed latching system to ensure quick access, and rubber matting to prevent movement and noise while driving. To top it off, OPS Public Safety stands by their products and workmanship by offering a lifetime warranty. “We really enjoyed working on this project,” said Joe Lawrenson, Manager of Business Development. “We find many departments looking for secure storage solutions that allow greater convenience and flexibility. Currently there are options that require users to extend their reach or climb into a pickup bed to retrieve their gear. 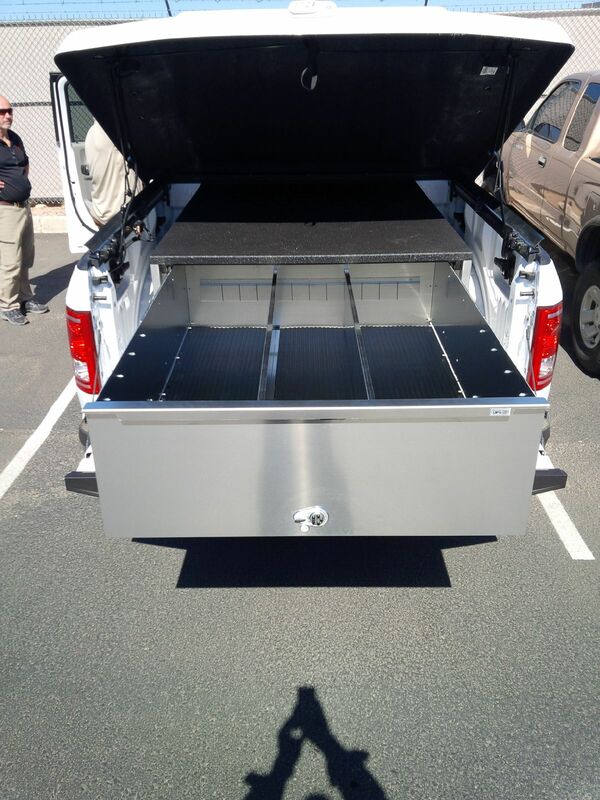 The OPS solution allows vehicle operators to securely store and access their kit and weapons with ease!”. 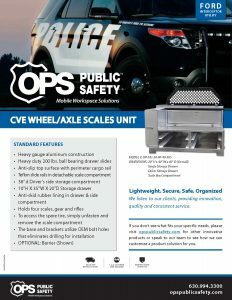 For more information on the OPS Public Safety CVE Scale Unit, please call Joe Lawrenson at 630.994.3300 x206. 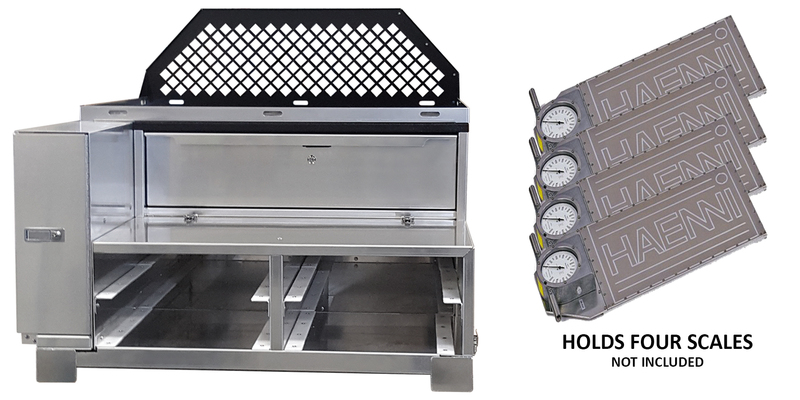 In 2017, a large police department in Connecticut, was in search for a storage solution to help organize their equipment and safely secure 4 portable Haenni scales used for inspections. 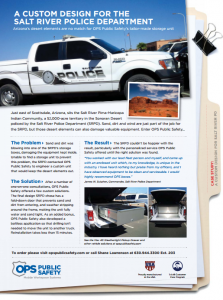 With a large variety of equipment – scales, rifles, gear and electronics – and required spare-tire access, this department found it challenging to find a solution to meet its unique needs and correspond with a strict timeline. In addition, the unit must have a masked appearance to avoid being recognized by anyone who is looking into the vehicle. 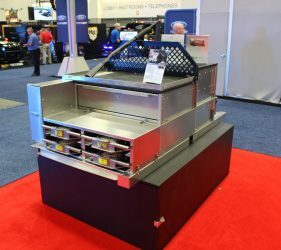 After one-on-one consultations, the OPS Public Safety team developed a CVE unit which included a gun box to store two rifles, a single drawer for miscellaneous gear and equipment, and 4 compartments to secure 4 HAENNI scales with a modified top to allow for an equipment tray to be mounted. 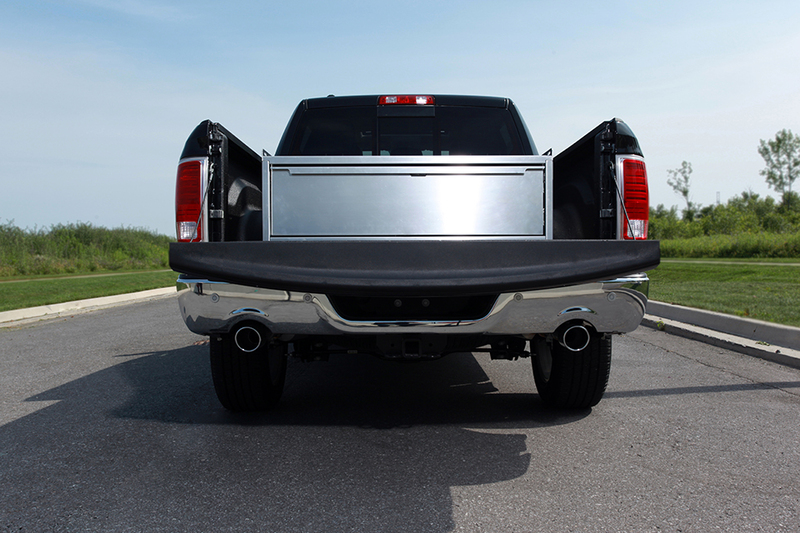 To ensure access to the spare tire, OPS Public Safety’s engineers created a design that included a removable front section to easily access the spare tire when need. And lastly, to guarantee that this unit was indistinguishable, a black top-coat was applied. The department was more than pleased with the final product and the OPS Public Safety staff’s commitment to finding a storage solution to meet their storage requirements, while being receptive to a strict timeline. “This was a great project for our team to work on,” said Joe Lawrenson, Manager of Business Development. “We find more departments are looking for a secure storage solution specifically for Haenni scales. 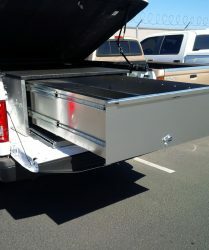 Currently these scales are placed in the back of an SUV or pickup, which slide around when driving. 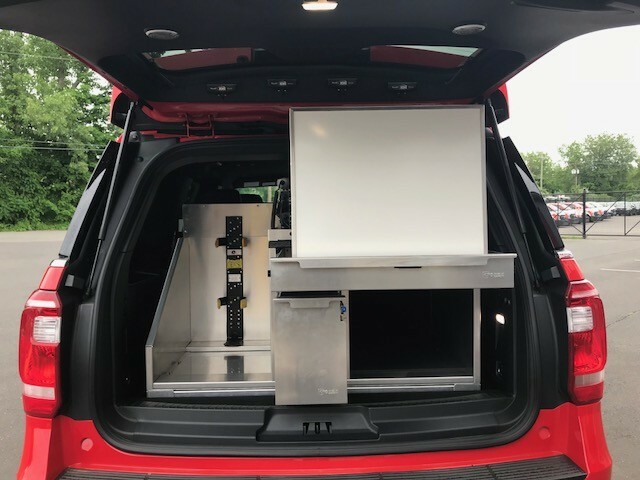 With our CVE scale solution, this allows our customers to safely store the scales units, equipment, and rifles securely within their vehicle”. *Source: Leandro, Nicole. “Inspections.” CVSA – Commercial Vehicle Safety Alliance, 2018, retrieved from cvsa.org/inspections/inspections/. The Problem Sand and dirt was blowing into one of the SRPD’s storage boxes, damaging the equipment kept inside. Unable to find a storage unit to prevent this problem, the SRPD contacted OPS Public Safety to engineer a custom unit that would keep the desert elements out. The Solution After a number of one-on-one consultations, OPS Public Safety offered a few custom solutions. 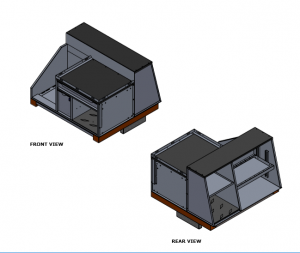 The final design SRPD chose has a fold-down door that prevents sand and dirt from entering, and weather stripping around the frame, making the unit fully water and sand tight. As an added bonus, OPS Public Safety also developed a boltless application so that drilling isn’t needed to move the unit to another truck. Reinstallation takes less than 15 minutes. 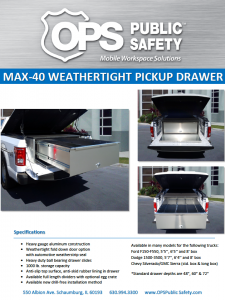 For more information on the OPS Public Safety Weathertight Pickup Drawer, please call Shane Lawrenson at 630.994.3300. 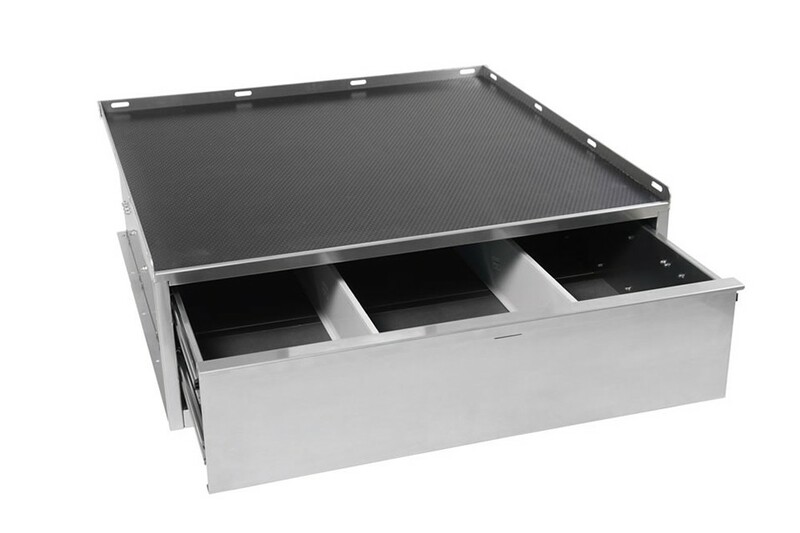 We have had nothing but positive feedback on our OPS Stacked Drawer series drawer units. The most noticeable difference from the older vehicles with storage is the noise difference. The new OPS Public Safety box is significantly quieter. That makes a big difference when driving with it for 12 hrs. I am very impressed with the functionality of the box. 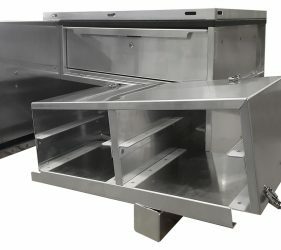 We use heavy steel breaching equipment and the gear fits perfectly across the width of the drawer and there is absolutely no drawer sag or hinge resistance during drawer opening/closing. The box is filled to capacity and all equipment can be accessed without taking everything out first. Kudos to the design team for putting together a box that truly stores the exact equipment used by the customer, instead of the customer trying to make their equipment fit an existing design. Please pass on to your team our greatest appreciation for such a great, high quality piece of equipment. My men are brutally honest and are critical of all the gear we test and evaluate. They will, and do put things to the test. Since we have started to roll these units out, I have not received one complaint. With that said, let me tell you what your product has done for us. With all the latest and greatest Tactical gear, our vehicles have become over loaded and unable to organize properly. We found ourselves having to empty the trunks to get to our gear and to find our tools – delaying the response of the men to critical incidents, where every second counts. Since the installed drawer systems, the men have been able to organize their gear and set them up to their individual needs. Also, our weapon systems are more secure, giving us a peace of mind when we are forced to leave our vehicles unattended. The system also allows for a faster rapid deployment of the men and their gear. What I would like you to pass on to your team, is with the quality product that you are supplying, you are without a doubt keeping my men safer and enabling them to deploy faster. Which ultimately keeps the public safer and saves lives. We are fighting the good fight. OPS Inc. has meticulously selected the materials that go into any product it makes. Careful consideration goes into the way the edges are finished, not only appearance but safety.